to dream and search and sway. who senses all with clarity. his feelings hard to sell. but one can never tell. and that works out quite well. needs all share, so we partake. is stirred by beauty there. if only he could fly. unspoken things give him answers to why. his joy you’ll never miss. he just might make you cry. and August needs a friend. And August is my friend. 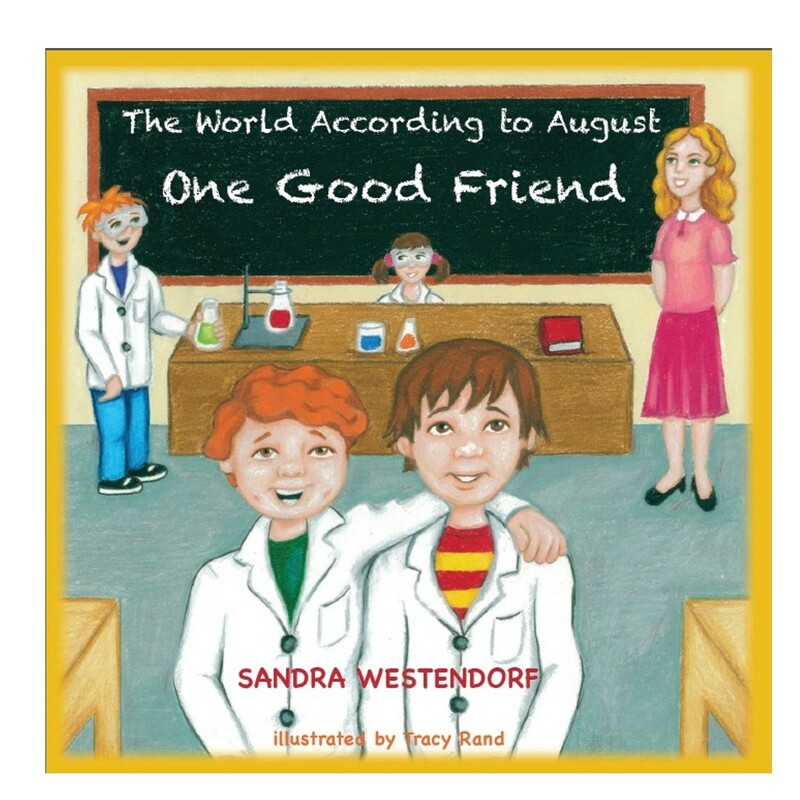 For more information about autism and “The World According to August – One Good Friend” by Sandy Westendorf refer to http://purplebirch.com/books.html . feelings which can be hurt, a sense of humour, and even a mischievous side. I heartily encourage you to support research into autism by purchasing this book. A percentage of the proceeds will be donated equally to support Canadian-American Research Consortium (Autism Research) and the International Society for Autism Research. I’ve reviewed this book, and I can vouch it, it’s well put together, and the story is both engaging and informative. A really great job in capturing the joys, and challenges of getting to know an autistic child Richard. I really loved the poem, insightful and sensitive. I couldn’t have said it better, James. It was the book that inspired poem. I would not have written the poem without this inspiration. The author is to be commended for giving us all an enlightened account and motivating us to action. Thank you for sharing your review of this wonderful book. My hope is that folks will be moved to purchase it and support research with its purchase. One of the best poems I’ve read in a long while. Thank you for your warm and generous comments, Magda. Thank you for caring and if you don’t mind, for sharing this message. Thank you for your generous comments. Poem for an Autistic Child was a pleasant, enjoyable experience. It was my response to S.L. Westendorf’s, The World According to August and I encourage anyone who enjoyed the poem to read Ms. Westendorf’s story. You can be sure that I’m an advocate of those with special needs and agree we should support the needs of those of all ages. This is such a beautiful poem Rich! You conveyed many emotional levels with this and the importance of having compassion for people like August.. August is lucky to have you as a friend too. I’m pleased that you were touched by my poem. Please consider the book that inspired me, The Word According to August by Sandra Westendorf. Much of the sentiment in the poem is an encapsulation of thoughts in that book. Portions of the proceeds fund research into Autism which is a cause I full support. I’m sincere about this and hope my comments don’t ring of shear sentimentality. I admire your writing, so your comments are especially touching. Thank You. Very nice poem; it gave me the shivers… It also gave me eyes to see. Thank you Nadina. It was all inspired by Sandy Westendorf’s book, The Word According to August. Much of the sentiment in the poem is an encapsulation of thoughts in that book. Portions of the proceeds fund research into Autism which is a cause I fully support. This was so lovely. One of my son’s is autistic and this made my day. To me this just made my day. Thank you! This is what I say to my son Michael every day! This was so beautiful. Anytime I can make someone’s day by sharing one of my posts, I feel it’s all the reward I need. As the parent of an autistic child, your comments have double the meaning. You have this is such a beautiful poem, and it is nice to know that there are other parents that get what Autism is and how we just want to make sure our child always feels special. Thank you. Thank you again, and feel free to share with other parents or let them have this link. so beautiful, and so right, Rich!! What lovely work!! Thank you, Jo. I was moved by a true story the mother shared about her son. My short poem merges the best of the book with my own inspiration. That is exactly the reason I shared it. If it helps someone gain more insight and a better understanding, I’ve met my goal.